I can say that it is possible to change a camshaft in a 63-64 Dodge Dart because I have personally done that job. With all Slant Six cam installations, the push rods, lifters, as well as the distributor, oil pump and fuel pump must be removed. The parts in front of the cam must also be removed. In reverse order these are the timing gears, timing chain cover, damper, fan, pulley and radiator. With the 63-64 Darts, the license plate must also come off. 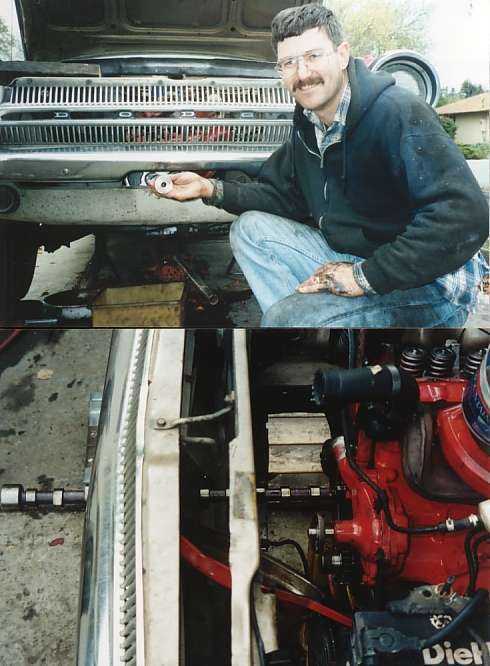 I had to raise the engine a few inches so the cam would slip through a narrow gap in the Dart's gravel pan. I removed the big nuts at the bottom of the engine mounts and lifted the engine with a floor jack. Note that a SL6 camshaft is 25 1/2 inches long so you can get a good idea about the room you need for the job by cutting a stick to 24", then holding it up to the center of the "X" stamped into the timing chain cover. It is my guess that an in-car SL6 cam swap is possible on many other body types, but to be sure, you should "cut a stick" and pull the radiator out of the car for a measurement. I would think twice about doing an in-car cam swap on any Air Conditioned equipped car, especially if it has a fully charged and working AC system. You really need to pull out the engine if you want to change the cam bearings.